We have recently recovered the stained glass windows and are placing them in the Bruschi Auditorium; the reclamation of the windows was part of the contract of sale. Light boxes have been built for the windows and are currently being wired. Some parishioners have inquired about memorializing a restored window; the cost of the restoration of each window was $5,000. If anyone is interested please contact Monsignor Hardiman at the rectory. 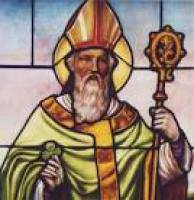 One window is already spoken for, so seven remain: 3 of events in the life of St. Patrick and 4 Dominican Saints, Sts. Dominic, Thomas Aquinas, Raymond, and Catherine of Sienna.